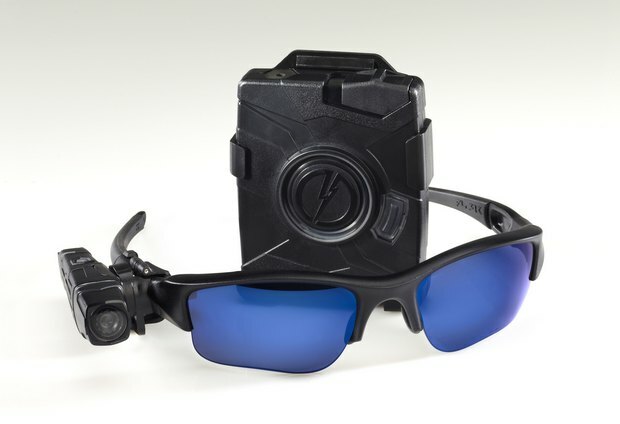 TASER, best known for their electric shock guns, has a new product: Tiny, sunglass-mounted cameras that upload live footage from a cop’s POV to the cloud. The idea? They will help prevent police brutality lawsuits and increase accountability. TASER has unveiled a line of lightweight, cloud-enabled cameras for police officers to wear on the job. The new AXON Flex system attaches magnetically to Oakley sunglasses and uploads a nonstop stream of camera footage to the cloud. Although TASER made their product announcement just a few hours ago, they already have a customer: The Bay Area Rapid Transit (BART) Police Department, which faces numerous charges of police brutality, has already ordered 150 cameras. Each camera stores between four and six hours of footage and has a 14-hour battery. The 15-gram DVR at the heart of AXON Flex records a tamperproof stream of footage from the officer’s POV (well, as long as it is turned on first) that is then automatically uploaded in encrypted form at the end of the officer’s shift to the Amazon cloud-powered Evidence.com service. TASER CEO Rick Smith told Fast Company that “it’s not just about storage, but about handling the security chain of custody.” Or, as he put it, “buying [these] cameras is cheaper than settlements” for law enforcement agencies facing brutality lawsuits. Once on the market in late March, the complete package for the AXON Flex (including a DVR and a separate, iPod-sized wireless controller) will market for $950. This is TASER’s second attempt to launch and market a cop-POV camera; the firm launched their first-generation TASER Cam–a headset-mounting video camera–several years ago. However, the TASER Cam is balky and uncomfortable for law enforcement to wear outside of special circumstances. The new AXON Flex is extremely comfortable–it weighs approximately the same as a Bluetooth headset and can either clip magnetically to special Oakley sunglasses or be affixed to an officer’s hat, clothing, or bike helmet. The project owes a heavy debt to Hadi Partovi, a TASER board member and Internet entrepreneur who largely joined the company to participate in this and similar projects. Partovi was previously a strategic advisor to Facebook and Dropbox whose iLike product was one of MySpace’s last big purchases back in 2009. Partovi helped serve as a crucial bridge between TASER and the world of cloud-based technology and web development. As soon as a law enforcement officer uploads video to Evidence.com, they lose control over the video. Individual users are unable to delete or edit videos already on the site; in order to avoid having damaging video ending up in an archive, individual officers will have to avoid turning their cameras on in the first place. 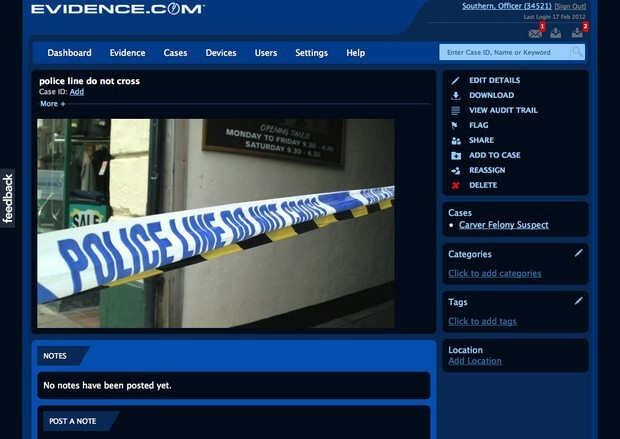 Evidence.com’s current package with TASER (for the TASER Cam) is currently used by over 500 law enforcement agencies nationwide. Video footage uploaded to Evidence.com is encrypted via RSA token and protected by SSL. Individual law enforcement agencies can set up their own security permissions to watch video uploaded by the AXON Flex; more liberal agencies can allow officers to log in remotely and watch videos from home, while stricter law enforcement institutions could restrict Evidence.com access to individual secure terminals. TASER’s electric shock guns are already equipped with cameras that turn on whenever they are drawn. These new cameras, however, have greatly enhanced shooting time (even though two hours barely covers a shift) and could be attractive to police departments which routinely deal with brutality and wrongdoing complaints. Even though individual cameras are not cheap, the manpower and administrative costs of handling complaint-related paperwork are considerable for most law enforcement agencies. BART’s decision to adopt the AXON Flex gives a good example of why police departments and law enforcement agencies may order the cameras in bulk. The agency has faced widespread allegations of police brutality, and faced widespread outcry after pulling the Syria-like move of knocking cell phone service offline to prevent a demonstration from gathering at a San Francisco train station. Being able to film contentious encounters may well assist BART when dealing with future brutality allegations. In addition, providing the cameras to individual officers is a savvy community relations move due to the perception that the officers themselves will be monitored. While TASER’s product isn’t a magic solution to solving the problem of police brutality and official wrongdoing, it’s a step in the right direction. The fact that the cameras currently only record two hours of video is a problem, but technological innovations mean that this will likely be rectified in the future. While the cameras might make activists happy, they also depend on one critical interface requirement–the fact that a law enforcement officer has to manually turn the camera on in the first place. Individual law enforcement agencies may also be uncomfortable with giving up de facto control over their video evidence rooms to a private firm. Lastly, like any other transformative technology, TASER’s camera creates new technical worries that didn’t exist before. Although Evidence.com appears to follow industry best practices for encryption and cloud security, there are still flaws associated with cloud computing. Putting law enforcement camera footage in one centralized online repository creates a tempting target for hackers and cybercriminals; this may well be a worry in organized crime cases where suspects have resources to launch cloud attacks. Still though, the cameras are likely to become a part of law enforcement toolkits nationwide. Correction: Due to a miscommunication, an earlier version of this article incorrectly stated the amount of footage each camera could store before uploading.